Are you kidding me? Is that a joke? We are the 1st of April, fool's day, and the weather is crappy, melting snow has been falling since this morning on New York and it is not really motivating. It has been a really long, bad winter, and I'm not even talking about the recent news on TV from around the world. However, because winter seems that it will last a bit longer, before we turn the page and start to drink more whites and springy roses, my wife and I continue to drink our favorite earthy, wintery reds from small, artisanal, sometimes hard to find producers from lesser known region. Talking of those, the following one is a great example of rare gem. Michael, my rep. from Metropolis, came to the store today to talk about some wines that we tasted recently and before leaving, left me a bottle of red wine with a peculiar name. "Bring it home and tell me what you think!" he said. I look at the label with a doubtful look.... "Vin de Pays des Balmes Dauphinoises"??? Where is this? I asked Michael. I never heard of it, simultaneously thinking: "Damn! They don't know what "Vin de Pays" to invent to be able to sell their wines, these French(s)!" I had to investigate and share this discovery with you. 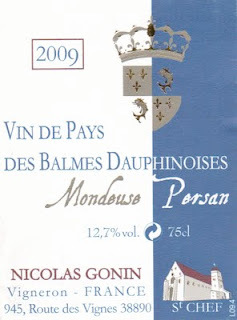 From what Micheal was saying, Nicolas Gonin is a character with a big heart and a passion for winemaking and developing indigenous, unusual grapes.You will immediately understand by looking at the label of this wine: Mondeuse and Persan being two local indigenous red grapes from the region. But where is this region? Mondeuse is a good indication, because it mainly grows in the Savoie region in France. Therefore, we must be near or in Savoie. Good thinking, by searching on a map where the wine comes from, I realized that the village of "Saint-Chef" is located west of the Savoie region, about half way (60 kilometers on both sides) between Lyon and Chambéry, in the "Dauphiné" (which evidently explains "Dauphinoises" on the label). The Dauphiné or Dauphiné Viennois is a former province in southeastern France, whose area roughly corresponded to that of the present departments of Isère, Drôme, and Hautes-Alpes. The Dauphiné was an independent state from 1040 to 1349, under the rule of the Counts of Albon, before joining the Kingdom of France. As a French province, the Dauphiné maintained its autonomy until 1457 and Grenoble has been its capital since the 11th century. Under the Ancien Régime, the province was bordered in the North by the River Rhône which separated the Dauphiné from the Bresse ("Brêsse") and Bugey ("Bugê"). To the east it bordered the Savoie and Piedmont, and to the south the Comtat Venaissin and Provence. The western border was marked by the Rhône to the south of Lyon. The Dauphiné extended up to what is now the center of Lyon. Mondeuse (or Mondeuse Noire) is a red grape variety primarily grown in the Savoie region of France. The grape can also be found in Argentina, Australia, and California. The grape was hit hard during the phylloxera epidemic of the 19th century, which nearly wiped out three quarters of the European vineyards between 1860s and 1930s. In Savoie, the grape is used in blending with Gamay, Pinot Noir and Poulsard where it contributes its dark color and high acid level, allowing the wines to age well. Persan is a fairly old, indigenous red grape variety that was nearly instinct and definitely forgotten until only a few years ago. A passionate, attentive and perseverant growers as well as a talented, yet humble winemaker, Nicolas Gonin spends a lot of time nurturing his vines. A few years ago, intrigued and unsure of his discovery, he had some grapes analyzed to confirm his feeling that he was in presence of a supposedly gone variety. "Persan" was reborn and Nicolas, ecstatic from his find, started to replant it. In these difficult times of pollution and globalization in terms of agriculture, it is very inspiring to witness that there are still some producers who dare coming back to the old style of winemaking, practicing Organic, Biodynamic, Sustainable and other Natural culture to protect the environment, revive the soil, enhance the natural habitat of the local fauna and flora, in order to produce healthier wines and other agricultural products. It is even more exciting and inciting when some of them offer a true renaissance to older, unheard of grapes rather than easily falling into the trap of the now too international Cabernet, Merlot, Chardonnay and Sauvignon grapes. His wish to return and produce quality wines in his native region goes back to the end of the 90s, although several very interesting positions were proposed to him. The official installation took place in 2005 with the takeover of his uncle’s vineyard, Gaston Gonin in Saint Chef which is about 30 minutes from Côte-Rôtie. The Domaine was slowly created with bits and pieces of vineyards from 20 different owners. 2,4 hectares of local vines were planted: Altesse, Mondeuse and Persan from 2003 to 2007. In 2005, a cellar of 250 m² was built with alveolar brick in terra cotta and with a roof of local Dauphinois style. Today, the vineyard is completely restructured; the bad plots of land were eliminated and the current surface of the domain is 5 hectares. Other projects of plantation are in progress. He started producing his first vintage from young vines in 2005. The Domaine now encompasses 6 hectares, unfortunately 2 not in production but soon to be. Crafted with roughly 50% Persan and 50% Mondeuse, depending on the vintage, because I think that actually it is 60% Persan and 40% Mondeuse for this 2009 vintage, this wine was vinified 100% Organic. It was the second harvest for the Persan wine, from vines planted between 2003 and 2005. The vineyard was already worked under Biodynamic method, but it is now fully Biodynamic certified since 2010. The vineyard are totally enherbed. In 2010, Nicolas Gonin will make a 100% Persan, which is a grape variety highly subject to mildiou and high acidity level, which convinced ancient producers to abandon it until its renaissance a few years ago. The grapes underwent 12 days of Maceration with pigeage every other day to gently maximize extraction and highlight the character of the grapes. I don’t think that it has seen any oak, or if it did, it was surely old, neutral oak for a short period of time. In any case, it doesn’t show on the palate. 500 cases were made and only a few reached the US market. 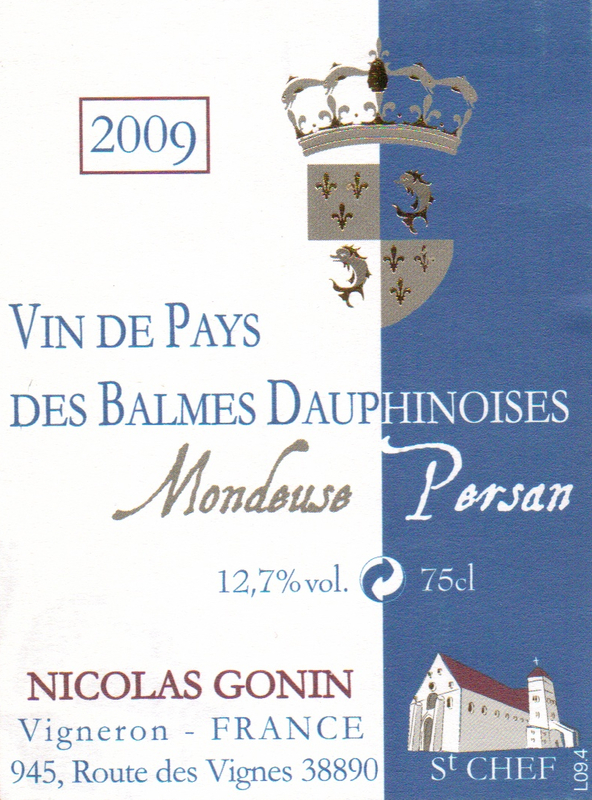 2009 Nicolas Gonin Persan - Mondeuse Vin de Pays des Balmes Dauphinoises presents a dark ruby color. The nose is somewhat restraint, but distinct yet discreet aromas of dark berry, earth and soil are immediately recognizable. On the palate, the attack is quite juicy and fresh, rapidly developing flavors of really dark ripe berries mingled with earthy components. This natural, Terroir oriented wine possesses great balance and enhancing acidity nicely carrying the fruit toward the dark, earthy, structured and somewhat rustic, lingering finish. Mondeuse usually produces light, crisp, fresh reds, yet it seems that Persan is conferring a lot of earthiness, texture and structure with a good grip of integrated tannins. Definitely a food friendly wine, revealing both the Terroir from which it comes from and the tendency of the producer to produce true, authentic and varietaly expressive wines.